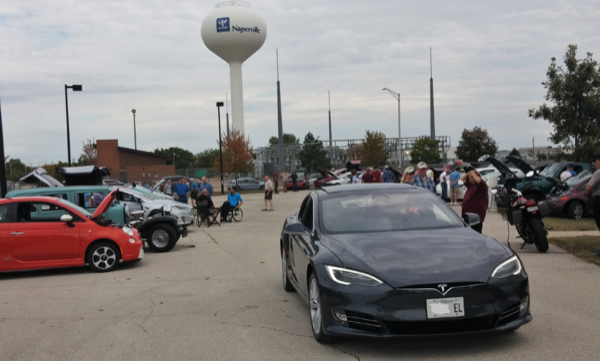 The Fox Valley Electric Auto Association met at the Naperville automobile test track and started out with a Parade of over 30 electric vehicles at 1:15 around the area to generate some excitement. Cars returned to the track and either parked in the view / discussion area or they drove into the holding area of the test track so visitors could get their test drives. We had about 120 people involved as visitors/guests / EV owners/ participants and the day was a great success! Come on out to the Naperville Electric Vehicle Ride-N-Drive Event Sunday Sept. 17 from 1-4 p.m. coordinated by the Fox Valley Electric Auto Association. Sponsored by Plug In America, the Sierra Club and the Electric Auto Association. Bring your own electric vehicle to talk about or show off, or for those who want to, jump in and take a test drive around the Test Track. Talk to the owners of a variety of unique electric vehicles some built from scratch, converted from gas to electric, others bought from car manufacturers. But get in the seat and feel the difference driving electric makes. We'll start off with a parade of EVs around the area at 1:15 sharp. There are currently 176 attendees registered. Registered attendees report 1,100,528 electric miles driven.